Last week I shared the best smallcap fund for investing in 2018 and how the best smallcap funds of 2017 had performed. This week we will do the same with the midcap funds. The midcap fund investor is of the view that he is ok to take on the sharp correction in the market for the extra gains that a midcap fund can provide. 2017 market was mainly driven by domestic liquidity via SIP route in mutual funds. It created issues for many fund manager to allocate the extra money to the right midcap stocks and may have created a kind of mini-bubble in the midcap space. For whatever it is worth, people prefer investing more in the midcap funds because they provide more stability than small-cap and better returns than the large cap. Kinda take the best of both the funds. Macros and other parameters are referring to correction but the market is factoring in good earnings from the midcaps company and so the expectations are high which isn’t very good. So if companies do not deliver, they will be punished and punished severely. So a midcap investor has to be really cautious and ready to take the pain of the correction in 2018 if there is one. Till then, let the profit ride. The Top Midcap Funds Of 2018 has to be from the best performing funds of 2017 that beat the midcap index or at least aren’t underperforming the benchmark by a big margin. Nifty Free float Midcap 100 index has given a return of 42% for the last one year and so any fund with under 40% return will be an unlikely choice. So here is the list of Top midcap funds of 2018. I have considered 39+ returns as well. So from the top performing funds for the past year, we nail down to funds that have the consistency of performance over a longer period of time. We select the funds with more than 30% CAGR returns for the past 5 years. It means a consistent fund for an elongated period of time. Both the funds have shown stellar performance but they also have the highest expense ratio among the midcap funds and I can’t ignore the expense ratio. We always invest in the direct funds over regular funds because of the lesser expense ratio. Aditya Birla Sun Life Pure Value Fund is the clear choice of midcap fund for 2018 because on every parameter it performs consistently. The best returns for the last 3 and 5 years and hasn’t disappointed with its performance in 2017 either. The return from the fund for the last 5 years is whopping 30% CAGR. We will need a consistent performer for 2018 because it is expected to be bumpy 2018 for midcaps because index won’t give 40% returns year after year. How The Best Midcap Funds of 2017 Performed? 2017 the performance of the mid-cap index was more than 40% which makes the performance of the best midcap funds of 2017 look bad. DSP BlackRock Small and Mid Cap Fund – The return from the fund has been 37.5% which is awesome in absolute terms but not when compared with the benchmark index. 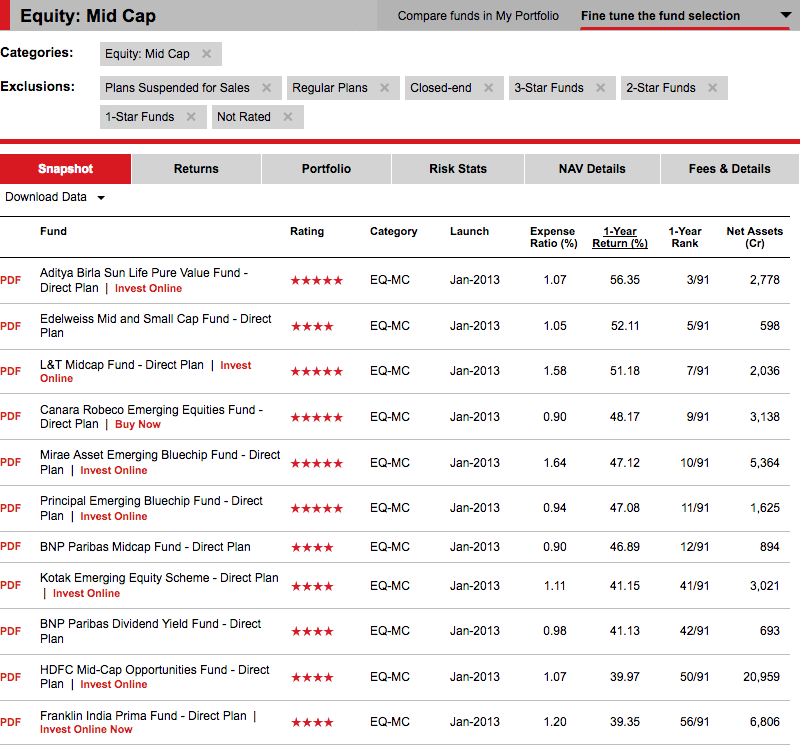 Sundaram Select Midcap Fund – The return from the fund like DSPBR Small and Mid Cap Fund is 38% but isn’t good enough to beat the benchmark index. Kotak Mid-Cap -The return from the fund for last one year is 42% and is in line with the benchmark. HDFC Mid-Cap Opportunities Fund – The return from the fund in last one year is 40% and is in line with the benchmark. 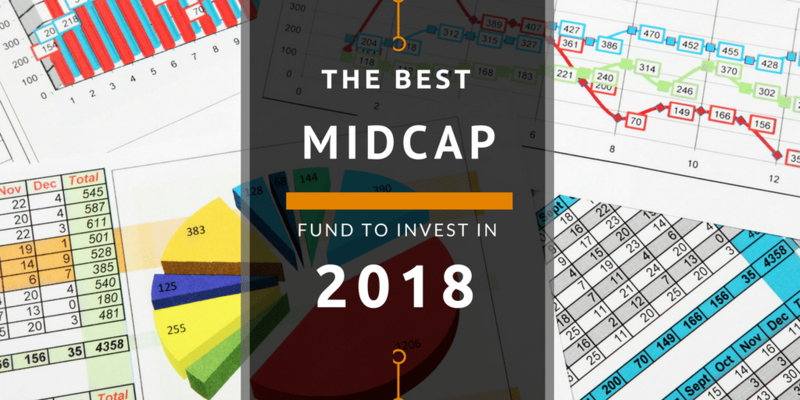 Mirae Asset Emerging Bluechip Fund – The only fund from the best of midcap fund of 2017 that beat the benchmark and has managed 47% return in the last one year. Funds managed to perform quite in line with the benchmark though beating the index by most of them would have been awesome. Do not switch funds every year and pay the entry or exit load but if you are planning to start a new SIP, it can be from the latest list of 2018 or if you have not selected a very good fund earlier, stop the SIP and create a new SIP in the new list of best funds of 2018. Again, as always this isn’t an endorsement to invest in the above funds but the emphasis is on the process to select the best mutual funds as and when you want to invest.